I am glad to say that I haven't any New York2 address at present. I go to New York several times each year, but I stop at a different hotel every time. Just at present I am on my way to visit my brother3 in Wyoming4. Anything you may wish to send me will eventually reach me if you will address it in care of - Mr. R. C. Cather, 1225 N. Center Street, Casper, Wyoming5. I am sorry to say that I have heard nothing of Francis Hill6 for many years. I am delighted to hear that you and Mrs. Seibel7 are both well. As for me, I am well - whenever I am not in New York. The air there is so filled up with gasoline that a country bred person cannot get enough oxygen to breathe. Although Cather typed 1937 on this letter, it seems to have been an error as the letter was most likely written in 1927. By 1937 Willa Cather had been in her Park Avenue apartment for several years and Roscoe Cather had moved to Colusa. Further, in #0891 she speaks in similar terms about not having a permanent address, as she had to move out of her Bank Street apartment later in 1927. 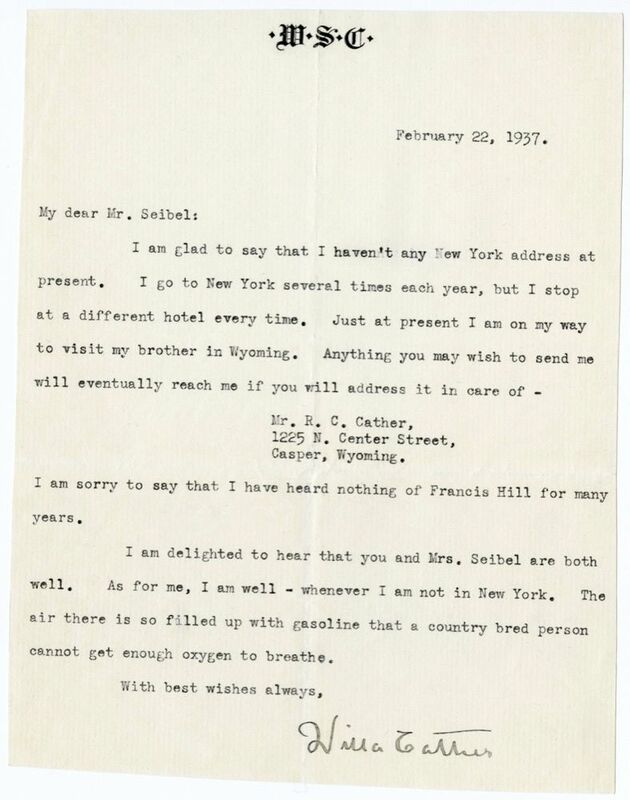 While Cather does not go to Wyoming in February 1927, she does visit Roscoe in June 1927, so she may have been misleading George Seibel in this letter, as she has done elsewhere. Hill, Charles Francis (1874-1953). American journalist and writer. 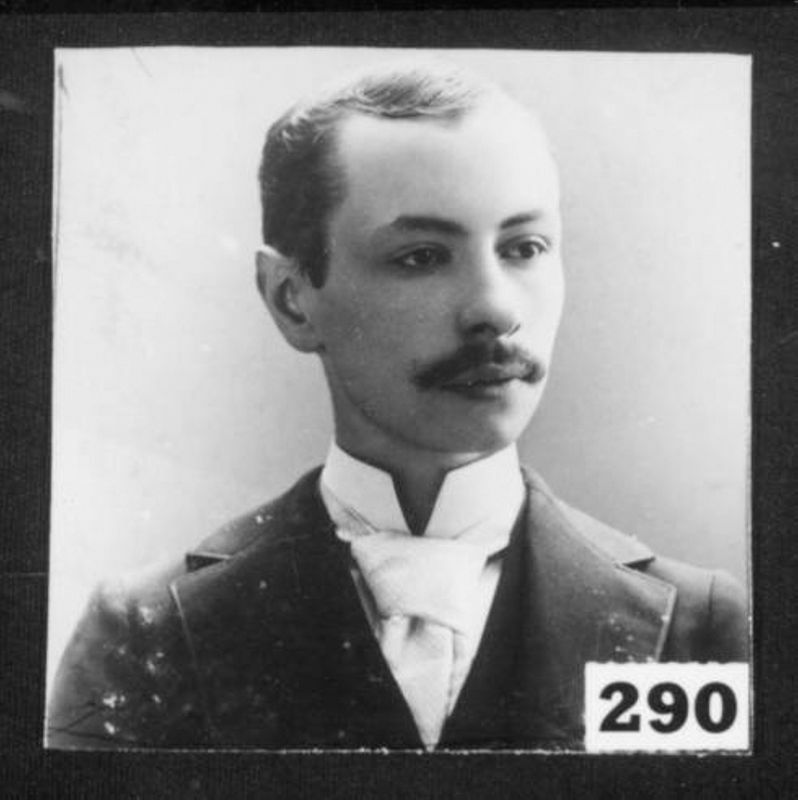 Born in Philadelphia, PA, eldest son of Will and Fannie Hill, Francis Hill grew up in Pittsburgh, PA. In the early 1890s he spent several years on an uncle’s ranch in Montana, then returned to Pittsburgh to work as a journalist. Hill wrote The Outlaws of Horseshoe Hole (1901), a boys’ book about rustling in Montana, and Once on the Summer Range (1918). He planned another book about life in a Pennsylvania village, which Cather, in a 1902 article, “Pittsburgh Authors Known to Fame,” predicted would become a permanent part of American literature. Hill later aspired to be a playwright, copyrighting a one-act play, Pittsburgh, in 1914. 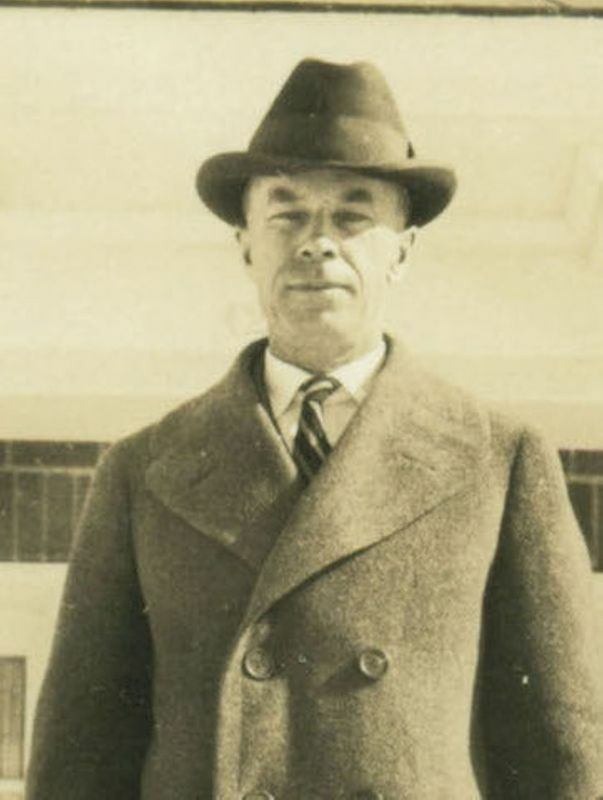 In the 1920s and 1930s he worked for the Philadelphia Record. He died in Cleveland, OH. In the late 1890s he became a friend of Willa Cather, who brought him to visit George and Helen Seibel; he also visited Cather at the McClung house. Cather told Dorothy Canfield that both Hill and Isabelle McClung were deeply involved with her work on The Troll Garden (1905) stories. By 1910, when Cather made her last known reference to Hill, they seldom saw each other.